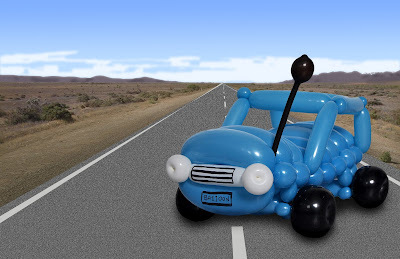 I have 2 birthdays to mention today, firstly Greg requested something and as he is a driving instructor I have made a car, its also Roy's birthday and tomorrow I will be making a balloon that Roy showed me the other day, happy birthday to both Roy and Greg. This car is made from 12 balloons, it took 4 x 260s to make up the main body, these are twisted into what is called a flat weave. I then added the axels from a 160 and wheels from 2 x 350s, Now I made the roof section from a couple of 160s and the aerial is a 260, finall I added the headlights from a 260 and the radiator from a 160.